NASCAR Sprint Cup Series #11 Joe Gibbs car driven by Denny Hamlin will be on display. SPRING VALLEY, MN – August 29, 2013: The Hunt for the USMTS Casey’s Cup is coming to The Creek this week during the 8th annual BP Labor Day Duel presented by Baudoin Oil. 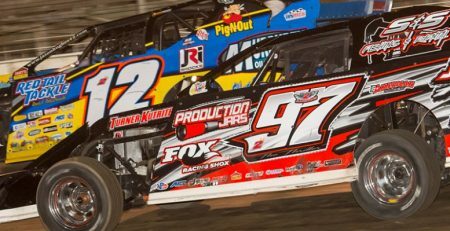 Rodney Sanders of Happy, Texas currently holds a one-point lead over Johnny Scott of Las Cruces, New Mexico but don’t coun t the driver currently in third place, Jason Hughes, the 2013 World Modified Dirt Track Champion. 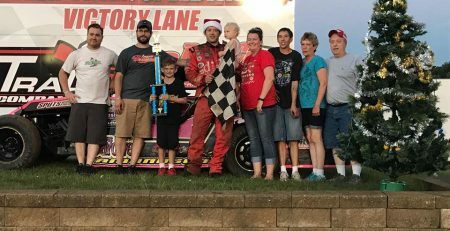 Also competing will be the ever popular Iron Man Challenge for USRA Stock Cars along with the WISSOTA Midwest Modifieds and WISSOTA Street Stocks. The pit gate opens at 2:00 and grandstand gates swing open at 4:00 with hot laps at 5:30 and racing at 6:00. Fans arriving early can catch the Slingshots racing on the Button Buck Speedway from 3:00 to 4:00 at no charge. Don’t miss out on the $1 pop, beer and hot dogs from 4:00-5:00! Fans in attendance will also have a chance to get up close and personal with the NASCAR Sprint Cup Series #11 Joe Gibbs car driven by Denny Hamlin thanks to the great folks at National Fleet Graphics. Car will be on display from 3:30-5:30 in the grandstand area. Adult general admission is $20 while kids ages 12 and under get in for $5. 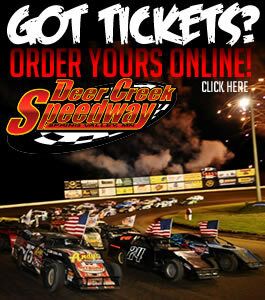 Tickets are available at www.deercreekspeedway.com or at the ticket window. Pit passes are $30. Deer Creek Speedway is a high-banked three-eighths-mile clay oval located 11.3 miles south of I-90 (exit 209) on SR 16, then 0.7 mile north on US 63. For more information call 507-754-6107 or visit www.deercreekspeedway.com.